Peace Now (Shalom Achshav) is the largest and most effective peace movement in the history of Israel. Belonging to the Zionist peace camp, Shalom Achshav was formed in 1978 during a foundering moment in the peace talks between Israel and Egypt. At that time 348 reserve officers and soldiers of the Israel Defense Forces petitioned their government not to lose an opportunity to make peace with both Egypt and the Palestinians. 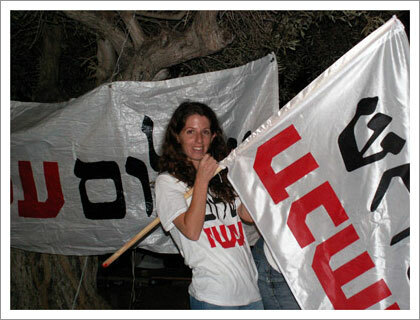 Tens of thousands of Israelis supported their position and the Shalom Achshav movement was born. Shalom Achshav works to promote peace with security for Israel, and a healthy democracy, through educational, advocacy and dialogue activities. Shalom Achshav’s mission is to help achieve what it believes to be the only solution to the conflict – a negotiated Israeli withdrawal from Palestinian territory and the creation of a Palestinian state in the West Bank and Gaza — otherwise known as the two-state solution. Support groups in the United States, Great Britain and France, as well as Canada, rally peace activists on behalf of Shalom Achshav. Within Israel, the movement is endorsed by prominent intellectuals such as Amos Oz, David Grossman and A.B. Yehoshua, and former Members of Knesset including Yossi Beilin, Avraham Burg, Tzali Reshef, Naomi Chazan, Yuli Tamir and Mossi Raz. Canadian Friends of Peace Now (CFPN) supports the agenda of Shalom Achshav and raises awareness here in Canada of the need for a viable solution to the Israeli-Palestinian conflict. CFPN is the largest Jewish organization in Canada that is Zionist and dedicated entirely to promoting Israeli-Palestinian peace on the basis of the two-state solution. With branches in Toronto, Montreal, and Ottawa, CFPN sponsors public talks and other events on Israeli-Palestinian peace issues, helping broaden the debate on major issues of peace and security. A registered Canadian charity, CFPN also holds fundraising activities to support Peace Now’s educational programs in Israel. Our donors receive tax receipts for their contributions.